I just like the word hodgepodge. 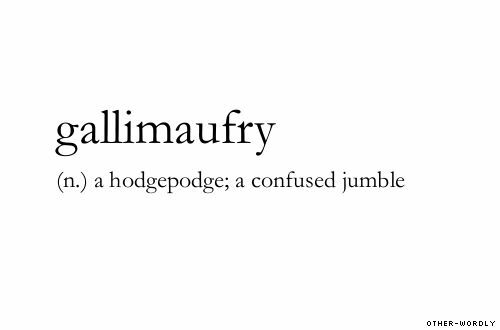 Also, this word looks an awfully lot like Gallifrey…you know the planted the Doctor is from? Coincidence? Mycroft and Sherlock say the world is rarely so lazy. Dang it! There I go mixing my metaphors…or randoms as it were. Oops? P.S. Now I’m thinking of Doctor Who, and trying to patiently wait until August. Just in case you were wondering, I don’t do patient well. This entry was posted on Thursday, July 3rd, 2014 at 10:00 pm	and tagged with Hodgepodge, Seductive Vocabulary, Words and posted in Words to Live By. You can follow any responses to this entry through the RSS 2.0 feed. I thought DW before I read your text. Of course I thought DW.